Vertical Striped Pants White by Michael Score. Vertical striped pants are essential for looking classic and modern. Dress trousers in white printed with skinny stripes in very dark navy. Constructed with button-up fly, belt loops and adjustable drawstring tie. Vertical striped pants made from smooth and lightweight cotton blend with minimal stretch. Includes side pockets, buttoned back pockets and small coin pocket on front. 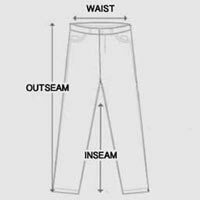 Slim fit pants designed with two parallel seams at the knee for a slightly tapered leg. Stay sharp for any occasion in these vertical striped pants. *Runs slightly short. For actual sizes, check the measurement tab below.